"GST" means Goods and Services Tax, GST (Hindi: जीएसटी) is a comprehensive indirect tax on manufacture, sale and consumption of goods and services throughout India. 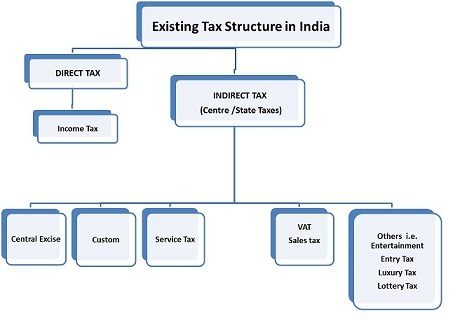 It is proposed system of indirect taxation in India merging most of the existing taxes into single system of taxation. System: A comprehensive System to make compliance easy and transparent. Tax Rates : Uniformity of tax rates and structures across all states with one Goods and Services Tax. Uniform Costs: This will ease the product costs for the long term, so industries can plan well in advance a uniform cost for all states. Latest GST News: Uncertainty clears for India, GST deadlock ends: All set for 1 July roll out. GST Service Tax: Luxury, standard, basic tax slabs to replace current rate on services, The goods and services tax (GST) Council is planning to bring different tax structure for services, The highest rate would be for luxury services, instead of a uniform rate of tax on all services, including cess and surcharge, the tax structure would possibly be on three rates: Luxury, Standard and Basic. It will be the first time since service tax was introduced in July 1994 that there would be more than one rate for the tax. Existing GST users can be logged into the site with username and password. Problem for Register or Update Digital Signature Certificate for GST? Failed to establish connection to the server, Kindly restart the Emsigner Click here to troubleshoot.